Want to inspire your students to explore where STEM and the arts meet? We invite all educators to enjoy free admission and special programming this Saturday at The Walt Disney Family Museum! We’ll show you ways to meaningfully incorporate the arts into engineering design challenges by bringing an example of a Walt Disney Studios animation innovation into your classroom. 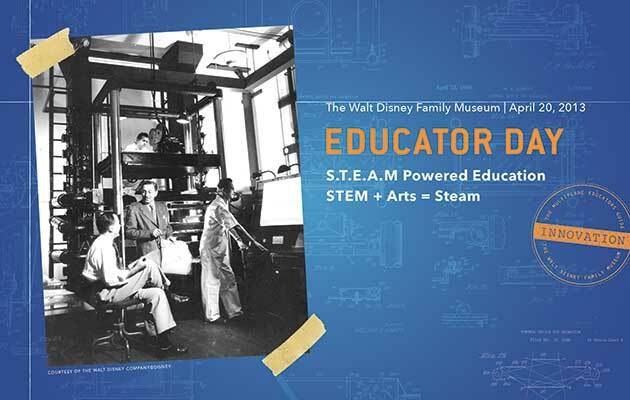 With a focus on adding the creative spark of the arts into STEM (science, technology, engineering, and math) activities, we’re keeping Walt Disney’s legacy of innovation alive in the 21st century. Please join us on Saturday, April 20th and please share this with any educator in your life. A special workshop led by industry leaders in design thinking. This methodology has grown out of technology and design industry practice, creating an opportunity to discuss how the STEM and the arts support 21st century skills such as flexibility, critical thinking, and problem solving. Email education@wdfmuseum.org with your name and educational organization if you’d like to participate. Dr. Alejandro Garcia, physics professor at San Jose State University, speaks on the nexus of science and art that occurs with computer-generated animation. As the physics consultant for DreamWorks Animation’s Madagascar 3: Europe’s Most Wanted, Professor Garcia illustrates the real-world value of educating students in both the arts and sciences. Simple Multiplane workstations and challenge cards provide an opportunity for visitors to explore how this Disney innovation works, and how it impacted to practice of 2-D animation. Challenge cards provide an example of the Museum’s own hands-on, learner-centered approach to educational materials.